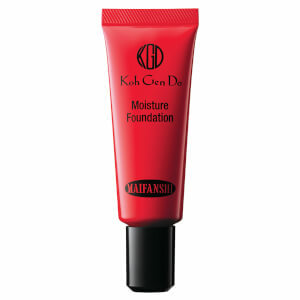 Perfect your complexion with Koh Gen Do Maifanshi Aqua Foundation; a unique formula that blends seamlessly onto skin to refine, hydrate and promote the same youthful glow experienced after a facial. Utilizing the brand's signature Gloss Film Powder (an innovative technology to minimize the appearance of pores and imperfections), the long-wearing liquid foundation delivers medium, buildable coverage with a flawless finish. Providing the benefits of a serum, its blend of skin-conditioning emollients and light-diffusing minerals from the deep waters of Bretagne, France, work in tandem to restore a bright, radiant complexion with a natural, dewy glow. Resists sweat, shine and oiliness. Apply foundation in sheer, buildable layers. Pat the foundation into the skin at all angles to blur lines and pores. Allow each layer to set before the next layer is applied. Water, Cyclopentasiloxane, Titanium Dioxide, Diphenylsiloxy Phenyl Trimethicone, Zinc Oxide, Hdi/Trimethylol Hexyllactone Crosspolymer, Isononyl Isononanoate, Peg-9 Polydimethylsiloxyethyl Dimethicone, Pentylene Glycol, Peg-10 Dimethicone, Mica, Diglycerin, Sorbitan Sesquiisostearate, Phytosteryl/Octyldodecyl Lauroyl Glutamate, Glycerin, Squalane, Sorbitan Sesquioleate, Sea Salt, Aluminum Hydroxide, Acrylates/Polytrimethyl Siloxymethacrylate Copolymer, Sodium Chloride, Silica, Butylene Glycol, Dimethicone, Phenoxyethanol, Stearic Acid, Simmondsia Chinensis (Jojoba) Seed Oil, Aluminum Dimyristate, Nylon-12, Talc, Zirconium Dioxide, Tocopherol, Lauroyl Lysine, Polymethylsilsesquioxane, Isostearyl Sebacate, Zinc Myristate, Alumina, Butyrospermum Parkii (Shea) Butter, Camellia Sinensis Leaf Extract, Disodium Stearoyl Glutamate, Glycyrrhiza Glabra (Licorice) Root Extract, Glucosyl Hesperidin, Magnesium Ascorbyl Phosphate, Sodium Hydroxide, Betula Alba Bark Extract, Kjellmaniella Gyrata Extract, Alpha-Glucan, Algae Extract, Alpinia Speciosa Leaf Extract, Glucosyl Ceramide, Hydrolyzed Conchiolin Protein, Acetyl Hexapeptide-8, Iron Oxides.